Every time a disaster strikes, it can cause serious damage to your organization if appropriate actions are not immediately implemented. A responsible business owner understands that disaster recovery planning is a complex process that should be approached in a responsible manner. Thus, you should use a disaster recovery checklist which outlines the steps you need to take in order to successfully deal with the crisis. A disaster recovery (DR) plan includes a set of clear guidelines and detailed instructions on how to act before, during, and after a disaster in order to minimize its negative impact on your organization, and resume mission-critical operations. Generally, a basic DR plan should include the following components: recovery objectives, incident reporting, action response, and recovery procedures. However, please note that every DR plan is unique as it takes into account custom business needs, recovery objectives, and the system vulnerabilities of a specific organization. What Is a Disaster Recovery Checklist? In addition to a DR plan, you also need to have a disaster recovery checklist. 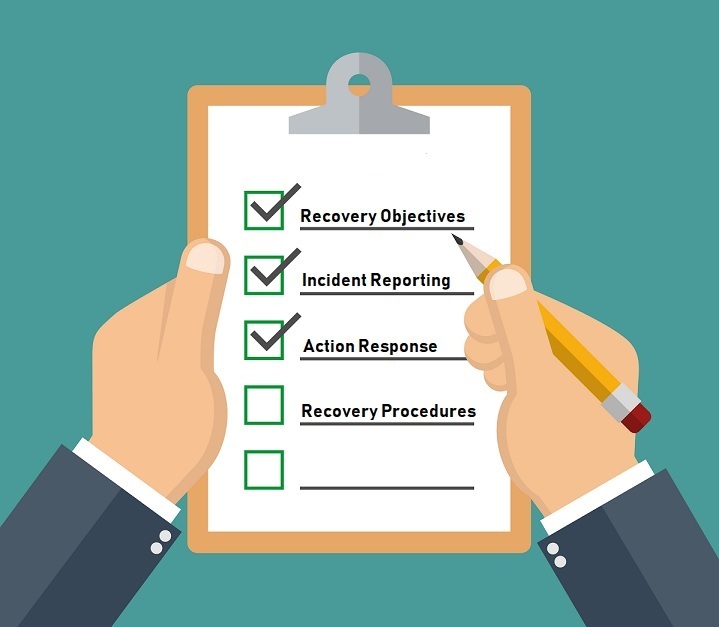 A disaster recovery checklist includes the steps which should be taken in order to rapidly resume business operations before any serious damage is done. A disaster recovery checklist can be used for quick reference to verify that all essential components have been included in a DR plan. On the other hand, a disaster recovery checklist is also extremely helpful during an actual disaster. You can consult the list to carefully monitor the DR process and verify that the plan is fully implemented. Today’s blogpost provides the ultimate disaster recovery checklist which outlines critical steps required for a successful disaster recovery. In order to determine which DR mechanisms will work best during an actual disaster, you first need to identify the threats and dangers to which your organization is most vulnerable. By performing a risk assessment and business impact analysis, you can identify the most likely threats and dangers, assess the probability of their occurrence, and calculate the possible impact of a disaster on your business. As a result, you can come up with effective prevention and mitigation measures and decide what your DR plan should include. The next point of the disaster recovery plan checklist is to establish DR objectives. Recovery time objective (RTO) and recovery point objective (RPO) are among the most critical values in DR planning. RTO determines the amount of time required to recover from a disaster and resume business operations. RPO, on the other hand, states the amount of tolerable data loss measured in time. You need to identify which business services and operations are most critical to your organization and set appropriate recovery objectives. RTO and RPO help determine which DR strategies to adopt in order to achieve expected DR results. If you want your DR plan to work, you should find people who will be responsible for its implementation during a DR event. For this purpose, you should create a DR team, with every team member assigned a specific role and a set of responsibilities. You should clearly state and document what is expected of them and which actions they should carry out when disaster strikes. Thus, you will be able to avoid any confusion during an actual disaster and ensure that every item on your disaster recovery plan checklist is realized. There is always a possibility that a disaster will severely damage your production center, thus making it impossible to resume operations at the primary site and forcing you to migrate critical workloads to another location. Due to this, the disaster recovery plan checklist recommends you to build a DR site which would be used for the purpose of emergency relocation of critical data, applications, staff, and physical resources. The secondary site should be equipped with enough hardware and software to take on the most critical workloads. Failback is the process of restoring operations at the primary production center after they have been transferred to a DR site during failover. DR sites can be used only for emergency purposes and they are not designed to run daily operations. They are generally built with the intention of being used for a very short period of time (until the primary site is restored or a new production center is built). Thus, you should think in advance about how to perform failback operations without causing any serious disruption to your business operations. Another point that should be included in every disaster recovery plan checklist concerns document security. Any given large organization has to deal with a large amount of data on a daily basis. An unexpected loss of critical documents can lead to disruption of business operations, as well as damage your company’s reputation. In addition, once you lose critical documents, whether digital or hard-copy, it is extremely hard to recover them. Hence, you should ensure that all critical documents are securely backed up and stored in a remote location. The same goes for your infrastructure documentation, which is an indispensable component of the DR process. No matter how good your IT team is, it is difficult for them to restore the entire IT infrastructure from scratch without having the required information about the original system and its components. Time is extremely valuable during a DR event. Therefore, you need to be aware that taking too much time to restore business operations and services can cause an irreparable damage to your organization. As for this point of a disaster recovery plan checklist, it is recommended that you conduct a complete inventory of all office equipment including computers, furniture, and other accessories. With this information, you will know how much equipment is required to restore the entire infrastructure to its original state and determine how much equipment is sufficient for supporting at least mission-critical workloads. The next point of a disaster recovery plan checklist is enabling internal communications. To successfully conduct DR activities, your employees, management team, and DR team should be able to communicate without interruption. In turn, you must determine which communication channels should be used when your primary data center gets hit by a disaster and your network infrastructure goes down. If, in spite of all your preventive measures, a disaster still manages to affect your production center, you need to stay focused and rapidly respond to the particular unfortunate event in order to minimize any possible damage. The first few hours of disaster recovery are crucial; thus, you need to clearly understand what to do and where to start when a disaster happens. For this purpose, create a document detailing every step of the disaster response procedure, including how to execute DR activities, who is responsible for conducting and monitoring the DR process, how to fail over to the DR site, how to verify that the system has been successfully recovered, etc. Also, you should take into account various DR scenarios and prepare response guidelines for different types of disasters. Ensure that everything is written in clear and straightforward language and there are as many details as possible about every DR activity. Once a disaster happens, you need to notify not only those who are responsible for executing DR activities but also key stakeholders such as members of the PR and marketing team, vendors, third-party suppliers, and customers. Also, consider how best to inform each of these groups and formulate answers for addressing their concerns. It is recommended that you write a press release in advance so as to waste no time during an actual disaster and have it ready for publication. Companies have a tendency to grow and change over time. Therefore, the DR plan which you created a year ago might not correspond to your current business needs and recovery objectives, and become out of date. The result of such neglect is failed disaster recovery and serious repercussions for your business. Note that creating a comprehensive and thorough DR plan is still not enough to ensure your business continuity and data safety. You need to see your DR plan in action and verify its efficiency. For that purpose, review and test a DR plan on a regular basis in order to see if there are any inconsistencies and identify what should be improved to achieve the best DR results. Your disaster recovery plan checklist should also include the information about the DR strategy to be implemented in case of a disaster. Recovering the entire IT infrastructure can be a challenging task, especially when it comes to large enterprises. Each organization is unique; as such, you should choose the DR strategy which complies with your business needs and expectations. You can either choose to perform do-it-yourself disaster recovery (a cheap but error-prone option) or turn to a third-party vendor (a costly but reliable and effective option). Take into account every aspect of your organization (e.g. number of employees, size of IT infrastructure, available budget, risk factors, etc.) to determine what will work best for you and your team. NAKIVO Backup & Replication is one of the most reliable, efficient, and affordable disaster recovery solutions on the market. More so, its Site Recovery feature has been specifically designed to simplify and improve the DR process and ensure that SMB and enterprise-level customers can operate at their peak performance even during a DR event. NAKIVO Backup & Replication allows you to create site recovery (SR) workflows by arranging various conditions and actions (start or stop VMs/instances; failover or failback VMs/instances; run, stop, enable, or disable jobs; wait; send notifications, etc.) into an automated algorithm. These SR workflows can be run either in production (when an actual disaster happens) or testing (prior to a disaster) mode. Non-disruptive SR testing is performed to verify the efficiency of created workflows and whether the expected recovery objectives can be met. With NAKIVO Backup & Replication, you can create multiple SR workflows of any complexity to fit various DR scenarios. Moreover, SR workflows can be modified and updated at any time in just a few clicks. With the release of the Site Recovery functionality, NAKIVO Backup & Replication has made disaster recovery affordable and easy-to-implement. Even with minimal input on your part, you can still be sure that every DR activity is executed as planned and no crucial item on your disaster recovery plan checklist is omitted. To find out more about this feature, read our series of blog posts on Site Recovery in NAKIVO Backup & Replication. Alternatively, you are welcome to download a full-featured free trial and test the product in your VMware, Hyper-V, or mixed environment today.